Cuba has had a communist political system since 1959 based on the "one state – one party" principle. Cuba is constitutionally defined as a Marxist–Leninist socialist state guided by the political ideas of Karl Marx, one of the fathers of historical materialism, Friedrich Engels and Vladimir Lenin. The present Constitution also ascribes the role of the Communist Party of Cuba to be the "leading force of society and of the state" and as such has the capability of setting national policy. The most recent leader was Raúl Castro, who held the title of First Secretary of the Communist Party of Cuba. As of 2018 Miguel Díaz-Canel is now the president of Cuba. Executive power is exercised by the Government, which is represented by the Council of State and the Council of Ministers. Legislative power is exercised through the unicameral National Assembly of People's Power, which is constituted as the maximum authority of the state. With effect from 19 April 2018, Miguel Díaz-Canel is President of the Council of State and President of the Council of Ministers (sometimes referred to as the Prime Minister). The previous president, Raúl Castro — brother of former leader Fidel Castro — remains First Secretary of the Communist Party of Cuba, and Commander-in-Chief of the Revolutionary Armed Forces. Fidel Castro ruled from 1959 to 2006 before illness forced him to hand power to his brother. Esteban Lazo Hernández is President of the National Assembly. Executive power is exercised by the government. Until February 2008, Cuba was led by President Fidel Castro, who was Chief of State, Head of Government, Prime Minister, First Secretary, and Commander in Chief of the Cuban armed forces. The Ministry of Interior is the principal organ of state security and control. According to the Cuban Constitution Article 94, the First Vice President of the Council of State assumes presidential duties upon the illness or death of the President. On July 31, 2006, during the 2006 Cuban transfer of duties, Fidel Castro delegated his duties as President of the Council of state, first secretary of the Cuban Communist Party and the post of commander in chief of the armed forces to first Vice President Raúl Castro. Cuba has an elected national legislature, the National Assembly of People's Power (Asamblea Nacional del Poder Popular), which has 612 members, elected every 5 years and holds brief sessions to ratify decisions by the executive branch. The National Assembly convenes twice a year in ordinary periods of sessions. However, it has permanent commissions to look after issues of legislative interest. Among its permanent or temporary commissions are those in charge of issues concerning the economy, sugar industry, industries, transportation and communications, constructions, foreign affairs, public health, defense and interior order. The National Assembly also has permanent departments that oversee the work of the Commissions, Local Assemblies of the People's Power, International Relations, Judicial Affairs and the Administration. Article 88(h) of the Constitution of Cuba, adopted in 1976, provides for citizen proposals of law, prerequisite that the proposal be made by at least 10,000 citizens who are eligible to vote. In 2002 supporters of a movement known as the Varela Project submitted a citizen proposal of law with 11,000 signatures calling for a national referendum on political and economic reforms. The Government response was to collect 8.1 million signatures to request that Cuba's National Assembly enact a constitutional amendment making socialism an unalterable feature of Cuban government. The Committees for the Defense of the Revolution is a network of neighborhood organizations across Cuba and most Cubans are members. The organizations are designed to put medical, educational or other campaigns into national effect, and to report "counter-revolutionary" activity. It is the duty of the CDR officials to know the activities of each person in their respective blocks. 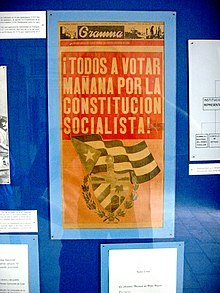 Suffrage is non-compulsory and is afforded to Cuban citizens who have resided for two years on the island. Such citizens must be aged over sixteen years, must not have been found guilty of a criminal offense, and cannot be mentally handicapped. Cubans living abroad are denied the right to vote. The national elections for the 612 members of the National Assembly of People's Power are held according to this system and the precepts of the 1976 Constitution. Under the system, neighbors meet to propose the candidates to the Municipal Assemblies. The candidates do not present a political platform, but only their resumes. The municipal candidates elected in each neighborhood then elect the Municipal Assembly members. In turn, the Municipal Assembly members elect the Provincial Assembly members, who in turn elect the national Assembly members. A direct vote is then cast to decide whether the decanted members that appear in the final step need to be ratified. Members of Politburo: Raúl Modesto Castro Ruz, José Ramón Machado Ventura, Ramiro Valdés Menéndez, Abelardo Colomé Ibarra, Esteban Lazo Hernández, Ricardo Alarcón de Quesada, Miguel Díaz-Canel Bermúdez Mario, Leopoldo Cintra Frías, Ramón Espinosa Martín, Álvaro Lopez Miera, Salvador Valdés Mesa, Mercedes López Acea, Marino Murillo Jorge, Adel Yzquierdo Rodríguez. Members of Secretariat: José Ramón Machado Ventura, Esteban Lazo Hernández, Abelardo Álvarez Gil, José Ramón Balaguer Cabrera, Víctor Gaute López, Olga Lidia Tapia Iglesias. Cuba's foreign policy has been scaled back and redirected as a result of economic hardship after the collapse of the Soviet bloc. Without massive Soviet subsidies and its primary trading partner Cuba was comparatively isolated in the 1990s, but has since entered bilateral co-operation with several South American countries, most notably Venezuela and Bolivia. Cuba has normal diplomatic and economic relations with every country in the Western hemisphere except El Salvador and the United States. El Salvador, under the new government of Mauricio Funes, is expected to institute both in June, 2009. The United States continues an embargo "so long as [Cuba] continues to refuse to move toward democratization and greater respect for human rights." The European Union accuses Cuba of "continuing flagrant violation of human rights and fundamental freedoms", but also "Reiterates its condemnation of the US embargo on Cuba, and calls for it to be lifted forthwith, as the UN General Assembly has repeatedly demanded." Cuba has developed a growing relationship with the People's Republic of China and Russia. In all, Cuba continues to have formal relations with 160 nations, and provided civilian assistance workers – principally medical – in more than 20 nations. More than two million exiles have escaped to foreign countries. Cuba's present foreign minister is Bruno Rodríguez Parrilla. Officially, Cuba is a people's democracy, as opposed to the "liberal democracy" of Western states. Cuba thus rejects criticism of its political system as a lack of apprehension for different forms of democracy other than those in capitalist states. It alludes to the grass roots elements in the nomination of candidates at neighborhood level (in the so-called circunscripciones). Opposition groups inside and outside the country as well as international NGOs and foreign governments have described the Cuban political system as undemocratic. The United States Government has initiated various policy measures; these have been ostensibly designed to urge Cuba to undertake political change towards a multi-party electoral system. These plans have been condemned by the Cuban Government, who accuses the United States of meddling in Cuba's affairs. The Cuban political system is normally described as undemocratic by human rights groups and academics and is usually classified as a dictatorship, one-party state or an authoritarian or totalitarian state. Those who see Cuba as a democracy have described it a grassroots democracy, a centralized democracy or a revolutionary democracy. Cuba is the only authoritarian regime in the Americas, according to the 2010 Democracy Index. Cuba's extensive censorship system was close to North Korea on the 2008 Press Freedom Index. The media is operated under the Communist Party’s Department of Revolutionary Orientation, which "develops and coordinates propaganda strategies". According to Maria Werlau, the extreme concentration of power to the Castro family seems comparable in modern times only to that of North Korea under the regimes of Kim Jong-il and Kim Il-sung. According to Human Rights Watch, Castro constructed a "repressive machinery" that continues to deprive Cubans of their basic rights. The Cuban government has been accused of numerous human rights abuses, including torture, arbitrary imprisonment, unfair trials, and extrajudicial executions (a.k.a. "El Paredón"). Human Rights Watch reports that the government represses nearly all forms of political dissent. There are many restrictions on leaving the country. The country's first ever transgender municipal delegate was elected in the province of Villa Clara in early 2013. Adela Hernández, born José Agustín Hernández, is a resident of the town of Caibarién and works as a nurse electrocardiogram specialist. In Cuba, delegates are not professional politicians and, therefore, do not receive a government salary. The 2012 Transparency International Corruption Perceptions Index ranked the Cuba 58th out of 176 countries, tied with Jordan and Namibia. and therefore has lower levels than most of the other countries in the Caribbean and Central America. Also ranked in 112th place in 2006, tied with India. ^ Peters, Philip (23 May 2012). "A Viewer's Guide to Cuba's Economic Reforms". Lexington Institute. ^ Cuban Political system Cuba education tools. ^ "Cuba's Parliament Seeks to Approve Constitutional Change Ratifying Socialism". Associated Press. June 21, 2002. Retrieved January 21, 2016. ^ "AFP: Cuba's neighborhood watches: 50 years of eyes, ears". web.archive.org. 2013-04-10. Retrieved 2019-03-06. ^ El sistema político y electoral cubano Archived 2009-01-30 at the Wayback Machine. Cubasocialista.com. Retrieved on 2011-09-30. ^ "Freedom in the World 2018 Cuba". Freedom House. ^ "US Lawmakers Say Normalize Cuba Relations" Archived 2009-09-03 at the Wayback Machine, lataminfo.org, April 2009. ^ "Cuban Democracy Act of 1992". State Department. ^ "EU-Cuba relations". Official Journal of the European Union. 4 September 2003. ^ Roman, Peter. "Electing Cuba's National Assembly Deputies: Proposals, Selections, Nominations, and Campaigns" (PDF). Retrieved 2 January 2015. ^ Mendoza, Juan. "Elecciones en Cuba - un proceso democrático". Cubadebate. Cubadebate. Retrieved 2 January 2015. ^ Human Rights Watch. "Country Summary: Cuba" (PDF). Human Rights Watch. Human Rights Watch. Retrieved 2 January 2015. ^ "Cuban official discounts US action". Television New Zealand. Reuters. 14 July 2006. Retrieved 3 November 2011. ^ Chavez appears with Castro in TV broadcast – World news – MSNBC.com. MSNBC (2005-08-21). Retrieved on 2011-09-30. ^ "Press Freedom Index 2008" (PDF). Reporters Without Borders. 2008. Archived from the original (PDF) on 2009-03-03. ^ Maria C. Werlau. "Fidel Castro, Inc.: A global conglomerate" (PDF). Archived from the original (PDF) on 2009-03-25. ^ "Cuba: Fidel Castro's Abusive Machinery Remains Intact". Human Rights Watch. ^ "Information about human rights in Cuba" (in Spanish). Comision Interamericana de Derechos Humanos. April 7, 1967. Retrieved 2006-07-09. ^ "Cuba". Human Rights Watch. 2006. ^ Fernando Ravsberg (8 January 2014). "Cuba's First Transsexual Politician". Havana Times. Retrieved 9 January 2014. ^ "Transparency International - the global coalition against corruption". Transparency International. 2012. Retrieved 24 March 2012. Erikson, Daniel P. (2005). "Charting Castro's Possible Successors". SAIS Review 25.1, 89–103. Evenson, Debra (1994). Revolution in the balance: Law and society in contemporary Cuba. Westview Press, Boulder. ISBN 0-8133-8466-4. (fr) Danielle Bleitrach and Jean-François Bonaldi, Cuba, Fidel et le Che ou l'aventure du socialisme, Editions Le Temps des Cerises, 2009 ISBN 978-2-8410-9671-8. This page was last edited on 22 March 2019, at 03:24 (UTC).